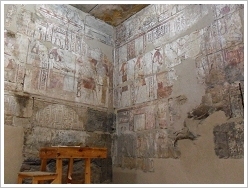 We had reported that Qasr el-Aguz is re-opened after long-lasting restoration (see our 15/12/12 news). Today, we have been there. To come straight to the point: The small Temple of Thot seems to be far away from a complete restoration. 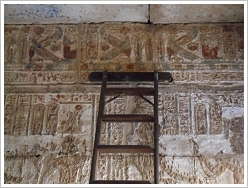 Inside and outside, there are still ladders and scaffolds, and only a part of the ceilings and walls had been cleaned yet. However, compared with older photographs the distinction is more than sharp - most notably: there is something recognisable now. 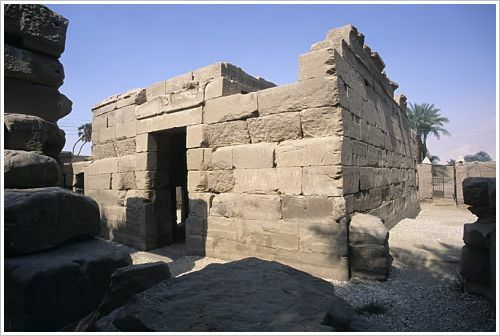 In 1156 BC the Mortuary Temple of Medinet Habu was scene of an unimaginable crime. Three preserved papyri talk about a conspiracy at the royal harem with the view to assassinate Pharaoh Ramses III (20th Dynasty, 1187–1156 BC). 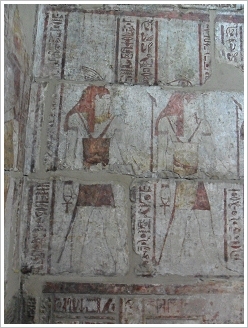 The mastermind behind was Tiye, one of his consorts, who wanted their son Pentawer to come to the throne. The annual Beautiful Festival of the Valley was fixed as date for the assassination. However, the conspiracy had been detected. All conspirators implicated in the plot were put on trial and executed or given the option of committing suicide. Ramses III died two weeks later - during the trial. Until now it was put about that he died of the consequences of a snake bite, for the plot was pulled by a poisonous snake. 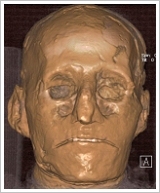 But now, the computed tomographical, radiological and moleculargenetic examinations of his mummy brought the likelier cause of death to light: The Pharaoh was killed by a blow from a sharp knife to the back of his neck. 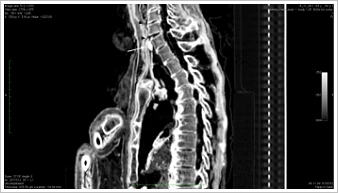 The scientific team led by archaeologist and former antiquities minister Zahi Hawass including geneticist Carsten Pusch (University of Tübingen, Germany) and palaeopathologist Albert Zink (EURAC Bozen, Italy) discovered by CT scan a deep, 7 cm wide wound to the throat just under the larynx. They also found a Horus eye amulet embedded in the wound - a charm most probably inserted by the ancient Egyptian embalmers during the mummification process to promote healing because for the ancient Egyptians it was very important to have an almost complete body for the after-life. The scientists also examined the mummy of an until then unidentified young man ("Unknown man E"). The tests reveiled that the man who was aged about 18 when he died, was a blood relative of Ramses III, and probability the king's son Pentawer. His body was not mummified in the usual way which might have been an punishment because of his involvement in his father's assassination. New evidence suggests the assumption he may have been forced to hang himself. Source: Zahi Hawass et al. : Revisiting the harem conspiracy and death of Ramses III: anthropological, forensic, radiological, and genetic study, in: British Medical Journal 2012;345:e8268, Download 2,37 MB. 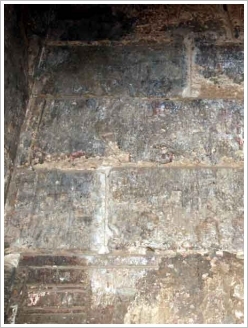 The restoration took seven years: cracks spread over the walls have been repaired, the paintings consolidated and the floor provided with a drainage system. Beyond that a new lighting system has been installed. Now, Qasr el-Aguz, the "Castle of the Old Lady" is waiting for visitors. In order to answer the repeatedly unsettling media reports on the security situation in Egypt, the Ministry of Tourism is planning a new project entitled "Egypt Now": From January 2013 on, live round-the-clock video broadcast of the country's main tourist areas will be shown on large screens in major squares in countries across the world. The Minister of Tourism predicted that a total of 11.6 million tourists would visit Egypt by the end of 2012, a 16 per cent increase over 2011. At the beginning of the week Luxor's Gouvernor Ezzat Saad stated that the tourism industry starts to go back to normal in Luxor.